Our Moisturizing Facial Creams are a wonderfully balanced blend of organic oils and waters, that penetrate the skin, providing hydration and deep nourishment for the face, body and soul. They can be used on sensitive skin, with an effect of feeling extremely nurtured. Apply as needed on face and body with the intention to be delighted and pampered. This cream should be kept cool and best used within 3- 4 months of purchase. Use the little wooden spatula to scoop the cream out of the container to prevent contamination. The reusable glass jars can be traded in for $1 off your next purchase. Treat yourself and someone you love to this luxuriant moisturizing cream! This Moisturizing Facial Cream is a wonderfully balanced blend of organic oils and waters, that penetrate the skin, providing hydration and deep nourishment for the face, body and soul. Fairtrade and organic shea butter is added to give an extra moisturizing effect and a thickening texture (in addition to a slight sunscreen protection). This cream can be used on sensitive skin, with an effect of feeling extremely nurtured and pampered. Apply as needed to face and body with the intention to completely nurture yourself. This cream should be kept cool and best used within 3- 4 months of purchase. Use the little wooden spatula to scoop the cream out of the container to prevent contamination. This Moisturizing Facial Cream with honey is a wonderfully balanced blend of organic oils and liquids, that penetrate the skin, providing hydration and deep nourishment for the face, body and soul. Honey is a humectant and is antibacterial; it helps seal in moisture. This cream can be used on sensitive skin, with an effect of feeling extremely nurtured. Apply as needed on face and body with the intention to nurture yourself. This cream should be kept cool and is best used within 3- 4 months of purchase. Use the little wooden spatula to scoop the cream out of the container to prevent contamination. This Moisturizing Facial Cream with Calendula flower infused oil is a wonderfully balanced blend of organic oils and waters, that penetrate the skin, providing hydration and deep nourishment for the face, body and soul. Calendula infused oil has antimicrobial qualities and is soothing to the skin, often used with good results for people with eczema. It can be used on sensitive skin, with an effect of feeling extremely nurtured. Apply as needed on face and body with the intention to nurture yourself. This cream should be kept cool and best used within 3- 4 months of purchase. Use the little wooden spatula to scoop the cream out of the container to prevent contamination. This Moisturizing Facial Cream with local Rugosa Rose petal infused water is a wonderfully balanced blend of organic oils and waters, that penetrate the skin, providing hydration and deep nourishment for the face, body and soul. This cream has a slight floral scent, uplifting to the senses. It can be used on sensitive skin, with an effect of feeling extremely nurtured and indulged. Apply as needed on face and body with the intention to fully nurture yourself. This cream should be kept cool and best used within 3- 4 months of purchase. Use the little wooden spatula to scoop the cream out of the container to prevent contamination. 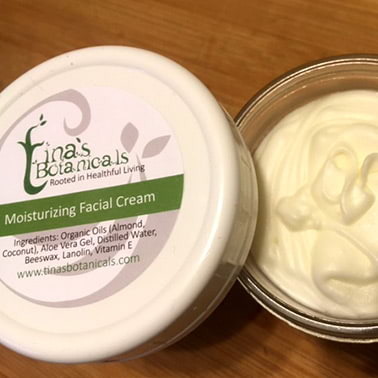 This Moisturizing Facial Cream includes organic fair trade shea butter and non nano zinc oxide to help provide UVB and UVA broad spectrum sun screen protection. This cream is a wonderfully balanced blend of organic oils, butter and waters, that penetrate the skin, providing hydration and deep nourishment for the face, body and soul. It can be used on sensitive skin, with an effect of feeling extremely nurtured. Apply as needed on face and body with the intention to protect your skin from the sun. This cream should be kept cool and best used within 3- 4 months of purchase. Use the little wooden spatula to scoop the cream out of the container to prevent contamination. Reapply as needed. Enjoy the rich moisturizing bar, which come in an eco-friendly cardboard push-up container; making it an intelligent choice and a very accessible way to apply it. This moisturizing bar is naturally nourishing and glides on easily as it is warmed by your skin, with no mess. I prepare each small batch in my kitchen and guarantee the highest quality. Your skin will feel healthy, moisturized, and radiant. The beeswax is sourced right here from our homestead, and is one of the main ingredients that help to nourish and protect dry skin, along with organic Shea butter and organic Coconut oil. Apply it generously to your hands, body, and face. Enjoy the handcrafted moisturizing bars, which come in an eco-friendly cardboard push-up container; making it an intelligent choice and a very accessible way to apply it. This bar is naturally nourishing and glides on easily as it is warmed by your skin, with no mess. I prepare each small batch in my kitchen and guarantee the highest quality. Your skin will feel healthy, moisturized, and radiant. The beeswax is sourced right here from our homestead, and is one of the main ingredients that help to nourish and protect dry skin, along with organic, fair trade Shea butter and organic Coconut oil. Lavender essential oil is added for a light floral and calming scent. Apply it generously to your hands, body, and face. This easy to use handcrafted lotion bar is made with Organic Coconut Oil infused with wildcrafted or locally grown Lavender flowers, Rosemary leaves, Thyme, Catnip, Yarrow flowers, Mint leaves, and Organic Cinnamon bark chips. These oils are blended with Organic Shea Butter, Local Beeswax, Vitamin E oil, and Lemon essential oil. While moisturizing your skin with this nourishing lotion bar, you can deter insects and be protected at the same time. Reapply as needed. This handcrafted sunscreen bar is made with local beeswax, organic coconut oil, organic and fair trade shea butter, non-nano zinc oxide, and vitamin E oil. It comes in an eco-friendly cardboard push-up container; making it an intelligent choice and very accessible way to apply it. This sunscreen bar is naturally nourishing and glides on easily as it is warmed by your skin, with no mess. I prepare each small batch in my kitchen and guarantee the highest quality. Your skin will feel healthy, moisturized, and protected. The beeswax is sourced locally, and is one of the main ingredients that help to nourish and protect dry skin, along with organic Shea butter which lends a slight sun screen and organic Coconut oil. Non nano zinc oxide is added to offer moderate to safe broad Spectrum Protection UVA/UVB coverage from the sun. Apply it generously to your hands, body, and face.